USS Enterprise (CV-6), often called the "Big E," was the sixth aircraft carrier of the United States Navy. She was also the seventh U.S. Navy ship to use the name. She was launched in 1936 and was a Yorktown class aircraft carrier. She was one of three American carriers brought into service before World War II which survived the war. She took part in more fights against Japan than any other U.S. ship. These fights included the Battle of Midway, the Battle of the Eastern Solomons, the Battle of the Santa Cruz Islands, many other fights during the Guadalcanal campaign, the Battle of the Philippine Sea, and the Battle of Leyte Gulf. At three different times during the Pacific War, the Japanese said that she had been sunk in battle. This lead her to be nicknamed "The Grey Ghost". Enterprise earned 20 battle stars. This was more than any other U.S. warship in World War II. Some have said that she is the most glorious and honored ship in the history of the United States Navy. However, the 18th century frigate USS ''Constitution'' could perhaps rival that. 2.4 The end of the "Big E"
2.5 Successor to the "Big E"
Enterprise was launched on 3 October 1936 at Newport News Shipbuilding. She was sponsored by Lulie Swanson, who was the wife of the Secretary of the Navy Claude A. Swanson. Enterprise was commissioned on 12 May 1938. Enterprise sailed south so that her performance could be tested. This took her to Rio de Janeiro. After she returned, she was used along the east coast and in the Caribbean until April 1939. This is when she was ordered to serve in the Pacific. Enterprise was one of fourteen ships to be fitted with the RCA CXAM-1 RADAR. She was first based in San Diego (where she was used in the movie Dive Bomber) and then at Pearl Harbor after President Roosevelt ordered the Fleet to be based far forward. Enterprise and the aircraft squads she carries trained a lot and moved aircraft among the island bases of the Pacific. Enterprise left Pearl Harbor on 28 November 1941. Enterprise was completing a transport mission, returning to Hawaii after moving Marine Fighter Squadron 211 (VMF-211) to Wake Island on 7 December 1941. This was when the Japanese attacked Pearl Harbor. Enterprise was returning to Oahu on the morning of 7 December 1941. 18 SBD Dauntlesses from Enterprise squadrons Scouting Squadron Six (VS-6) and Bombing Squadron Six (VB-6) arrived at Pearl Harbor while the Japanese were attacking it. Even though they were surprised, they quickly went into action to defend Pearl Harbor. VS-6 lost six planes during the attack. VB-6 lost one. Many of these planes were shot down by the Japanese. However, at least one plane was lost to anti-aircraft (AA) fire, and many more were damaged. During the battle, one radio report was heard: "Do not attack me, this is Six Baker Three an American plane". Later, the same pilot (Ensign Manuel Gonzales from VB-6) was heard telling his radioman/gunner to get ready to land on the water. Lieutenant C. E. Dickinson and his crewmate William C. Miller, from VS-6, shot down one Japanese plane before they had to jump out after their plane caught fire. Dickinson later went to Ford Island to fly another plane. He took part when the United States were searching for the Japanese fleet. Enterprise also sent up six F4F Wildcats from Fighting Squadron Six (VF-6) during the attack. All of these aircraft except two were shot down by shellshocked AA gunners when they tried to land on Ford Island later that night. Enterprise got her aircraft ready to go on a large search for the Japanese force that attacked Pearl Harbor. They search was to the south and west of Oahu. However, the Japanese had started moving northwest. Enterprise went into Pearl Harbor for fuel and supplies on the night of 8 December. Early the next morning, she went to patrol the rest of the Hawaiian Islands to make sure there were no more attacks. Even though the group did not find any ships, Enterprise aircraft sank Japanese submarine I-70. I-70 was sunk at 23°45′N 155°35′W﻿ / ﻿23.750°N 155.583°W﻿ / 23.750; -155.583﻿ (USS Enterprise sinks I-70) on 10 December 1941. During the last two weeks of December 1941, Enterprise and her group moved to the west of Hawaii to make sure those islands were not attacked. Two other groups tried to help at Wake Island at the same time. After the Enterprise group had a short rest at Pearl Harbor, they left on 11 January. They were protecting ships sending help to Samoa. On 1 February, Enterprise's Task Force 8 raided Kwajalein, Wotje, and Maloelap in the Marshall Islands. They sank three ships, damaged eight and destroyed many aircraft. 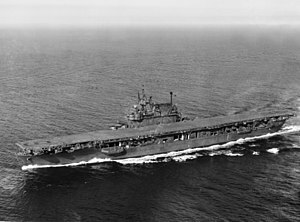 Five days later, Enterprise sailed for the South Pacific to help other U.S. carriers in the Coral Sea. However, the Battle of the Coral Sea was over before Enterprise got there. On 28 May, Enterprise moved, as Rear Admiral Raymond A. Spruance's flagship, to Midway. She was ordered to hold Midway and do as much damage to the enemy as possible. USS Hornet, six cruisers and 10 destroyers were with Enterprise on that day. Both the Americans and Japanese launched air attacks. Even though the fighting went on until 7 June, by the end of 4 June the result had been decided. The Battle of Midway began on the morning of 4 June 1942, when four Japanese carriers attacked on Midway Island. The Japanese did not know that the U.S. Navy was in the area. Just three hours after the first bomb hit Midway, planes from the U.S. carriers attacked. Enterprise launched an attack using torpedo bombers, but this failed. Soon after this, Enterprise dive bombers attacked and sank the Japanese carriers Kaga and Akagi. 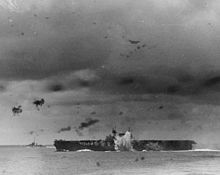 Later in the afternoon, bombers from Enterprise and USS Yorktown sank Hiryu (aircraft from Yorktown also sank Sōryū). Yorktown and USS Hammann were the only American ships sunk, but 113 planes were lost. 61 of these were lost during the attacks. Japanese losses were much bigger. They lost four carriers, one cruiser and 272 planes. Even though she lost many planes, Enterprise returned to Pearl Harbor on 13 June 1942 undamaged. Enterprise during the Battle of the Santa Cruz Islands, 26 October 1942. After a month of rest, Enterprise headed on 15 July 1942 for the South Pacific. There, she helped support the attack on the Solomon Islands on 8 August. During the Battle of the Eastern Solomons, the Japanese light carrier Ryūjō was sunk. The Japanese troops that were supposed to land on Guadalcanal was forced back. Enterprise was hit three times. 77 sailors were killed and 91 were hurt. Enterprise was damaged badly. Enterprise was fixed at Pearl Harbor from 10 September-16 October 1942. 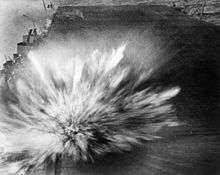 A Japanese bomb explodes on the flight deck of Enterprise on 24 August 1942 during the Battle of the Eastern Solomons. It caused a small amount of damage. On 13 November, pilots from Enterprise helped to sink Hiei. 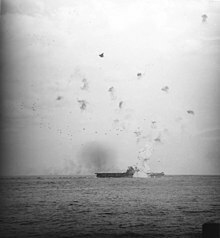 When the Naval Battle of Guadalcanal ended on 15 November 1942, Enterprise had helped to sink 16 ships and damage eight more. On July 20 1943, Enterprise started being upgraded. These happened over several months. She was given an anti-torpedo blister. This meant that the carrier would be protected more against torpedoes. This F6F Hellcat crash landed on Enterprise's flight deck. Enterprise was back by November 1943. She helped the U.S. soldiers landing on Makin Atoll from 19–21 November 1943. Enterprise launched planes to strike the Marshall Islands and helped U.S. soldiers land on Kwajalein from 29 January-3 February 1944. Then she went to strike the Japanese base in Truk Lagoon in the Caroline Islands on 17 February. Enterprise on the right with the Fifth Fleet at Majuro, 1944. Enterprise launched planes to hit Jaluit Atoll on 20 February. She helped troops who were landing on Emirau Island (19–25 March). On 14 April she helped troops to land in Hollandia (currently known as Jayapura), in New Guinea. On 19 June 1944, Enterprise took part in the Battle of the Philippine Sea. For over eight hours, American and Japanese pilots fought. Over two days, six American ships were damaged. 130 planes and 76 pilots and aircrew were lost. American aircraft and U.S. submarines sank three Japanese carriers (Hiyō, Shōkaku, and Taihō). The Japanese lost 426 planes. Enterprise helped to defend the U.S. ships and to strike the Japanese ships. 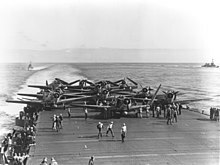 After the battle, Enterprise helped with the invasion of Saipan until 5 July. She then went back to Pearl Harbor for a month of rest. She came back on 24 August and attacked the Bonin Islands from 31 August – 2 September. In the Battle of Leyte Gulf (23–26 October), Enterprise planes attacked battleships and destroyers. During November, planes from Enterprise hit Manila and Yap. She returned to Pearl Harbor on 6 December 1944. A photo taken from Washington shows an explosion on the Enterprise from a kamikaze. Enterprise sailed to Pearl Harbor with 1,100 soldiers. She then started sailing to Europe. She brought 10,000 soldiers home. During the Enterprise’s last trip, the ship was caught in very high winds in the Atlantic. The crew almost abandoned ship. Enterprise had to go back to New York. Enterprise got a British Admiralty Pennant. The pennant was given to Enterprise as a gift from an ally. Enterprise is the only non-Royal Navy ship to get the award in more than 400 years. Enterprise went into the New York Naval Shipyard on 18 January 1946 to be deactivated. In 1946, she was going to be given to the state of New York to be a memorial. However, this plan was cancelled in 1949. The "Big E" was sold on 1 July 1958 to the Lipsett Corporation to be scrapped. Scrapping was done in May 1960. Stern Plate of the USS Enterprise located in River Vale, New Jersey. In November 1961, USS Enterprise (CVA(N)-65) was brought into service. This was the world's first nuclear-powered aircraft carrier. The Enterprise (CVN-65) was decommissioned on 1 December 2012. Another Enterprise would be a Gerald R. Ford-class aircraft carrier, CVN-80. Enterprise also got the Navy Unit Commendation and 20 battle stars for World War II service. This means that she is the highest decorated US ship ever. ↑ 1.0 1.1 Macintyre, Donald, CAPT RN (September 1967). Shipborne Radar. United States Naval Institute Proceedings. ↑ During the first year of the war, the Yorktown class carriers had proved to be extremely vulnerable to torpedoes. ↑ Friedman, Norman. U.S. Aircraft Carriers: An Illustrated Design History (1983), p. 100. ↑ "News Release – Navy's Next Ford-Class Aircraft Carrier to be Named Enterprise". U.S. Navy. 1 December 2012. Retrieved 1 December 2012. . This article incorporates text from the public domain Dictionary of American Naval Fighting Ships. "Enterprise: America's Fightingest Ship and the Men Who Helped Win World War II," by Barrett Tillman. The first to last history (2012). This page was last changed on 11 January 2018, at 04:55.